David Plink (r.), Geschäftsführer des Top Employers Institute, gratuliert Tilmann Meyer (l.), Leiter Personalbeschaffung und Entsendungen, zum guten Abschneiden von Brose. Automotive supplier Brose is one of the top employers in the automotive industry. 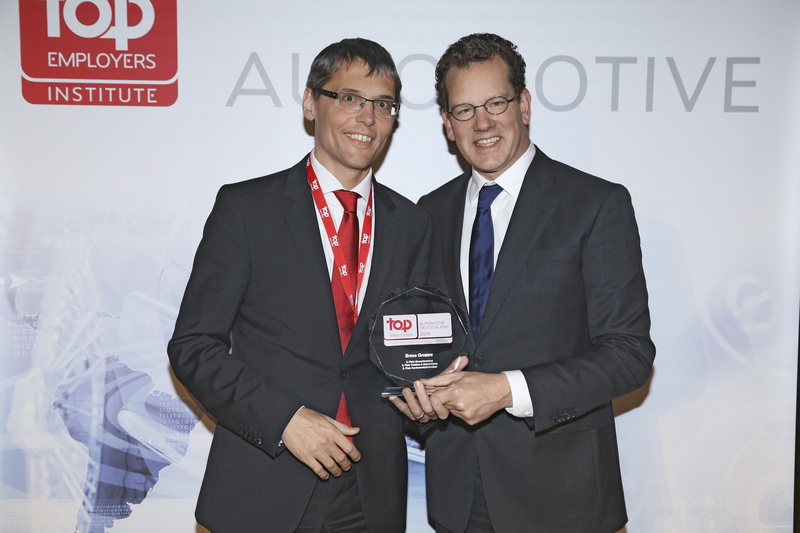 This is the outcome of the "Top Employers Automotive 2014" study presented by the International Top Employers Institute during an official awards ceremony held in Stuttgart on November 14. Brose received an award for third place. actual working conditions and career prospects for university graduates, young professionals, specialists and managerial staff. "This study considers industry-specific characteristics," explains Dennis Utter, Regional Director at the Top Employers Institute and adds: "Applicants can easily see the companies' offers tailored to the specific interests of this target group." Brose scored above-average results in nearly all categories and was among the top three in the sub-categories "training and development" and "career opportunities". "Optimal conditions ensure the personal and professional advancement of employees. Our extensive study recognizes Brose's excellent working conditions and their efforts to train and promote talented staff at all levels. Brose offers a wide range of creative initiatives, from secondary benefits and working conditions to elaborate performance management programs in-line with the corporate culture," says DennisUtter, Regional Director at the Top Employer Institute. is to attract suitable employees, train them even further, retain them, and keep them motivated and performance-oriented in the long term. For Brose these are important criteria for sustainable success."